Tivat is a coastal town in southwest Montenegro, located in the Boka Kotorska. It has a population of 9,467. Tivat is the center of Tivat municipality with a population 13,630, which is the smallest municipality by area in Montenegro. It is located in the central part of the Boka Kotorska, south of mount Vrmac. The municipality lies mostly south of the town, and also has an exit to open sea at the tourist location Pržno inlet near Radovici village in south. Its central part, where Tivat Airport is located, lies in fertile Grbalj valley. The airport is located near the isthmus of Luštica peninsula, which belongs to the municipality of Herceg Novi for the most part. 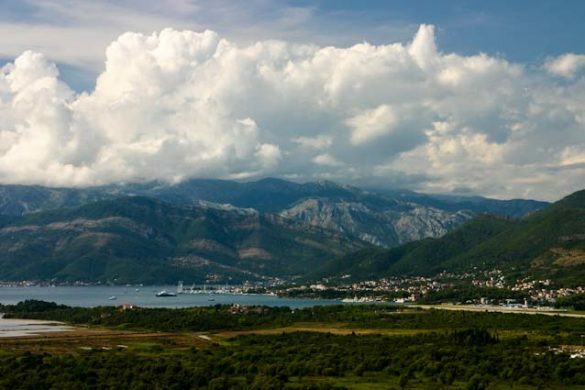 The origin of Tivat supposedly goes back to the 3rd century BC Documents prove as well that Tivat was an important religious center in the 14th and 15th centuries. The Monastery of St. Michael the Archangel was the seat of the Orthodox Archbishopric of Zeta. Tivat, the youngest town in the Boka area was established on the spacious plateau at the bottom of Vrmac. According to the archives of Kotor, the following names were mentioned here in the 14th century: Teude, Theode, and Theudo who are related to the queen Teuta.There are not many written traces of the events that happened in this region at the time of Houses of Nemanjic, Balšic, Crnojevic, Venice, France, and Austrians. During the Middle Ages the fertile lands of the Tivat area belonged mostly to the aristocrats of Kotor, Prcanj and Dobrota. There were their big properties, castles, and chalets as well as the collective church of St. Anton dating from 1373. Part of this inheritance, which was the property of the wealth Buca family, is a marvelous chalet which today houses Tivat’s museums and galleries. The residence of the metropolitan of the Zetan diocese was built from the 13th to the 15th century on Prevlaka Island. Tivat (called Teodo in Venetian language), was under the Republic of Venice as a part of Albania Veneta from 1420 to 1797. 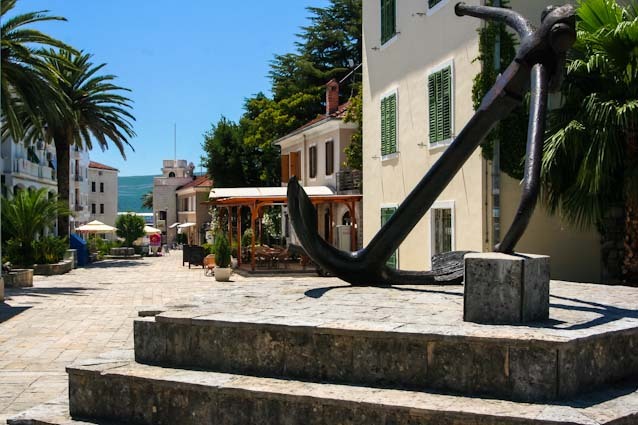 Tivat turned into a town by the end of 19th century when in 1889 the Naval arsenal was built by Austrians, and was later used as a military base of Army of Montenegro). Currently, a Canadian businessman Peter Munk built a vacation resort and mega-marina named “Porto Montenegro“. Beginning from 1971 the Tivat airport acquired the modern runway and it is now a significant airport for foreign air traffic. The tourist potential of Tivat is yet to be fully realized. 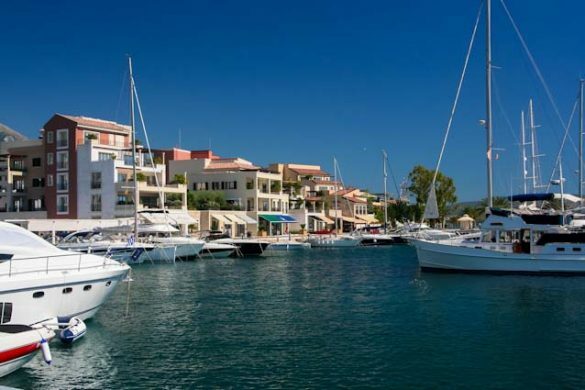 Only the inlets near Prevlaka, as well as the localities of Župa and Kalimanj, provide great conditions for the construction of marinas and yachting clubs. Even today, Tivat represents an interesting place for navigators. This little town is aiming to attract many guests in the third millennium. Although it is the youngest town in the Boka Kotorska region, Tivat has a lot of interesting and attractive destinations. Renaissance Summer House Buca in the center of city, Ostrvo Cvijeca with sacred monuments, Gornja Lastva, the old nucleus at an altitude of 300 m, the magnificent sandy beach at Plavi Horizonti and the Sveti Marko Island are the most visited tourist destinations in Tivat area. In the city itself there is the natural port Kalimanj. Tivat is also the only place at the Montenegrin coast with an airport. There is also a choice of cultural events, such as “Bocce Olympiad” and “Summer Fest”. “Plavi Horizonti” (Blue Horizons) in Radovici, “Mimoza” (Mimosa), “Kamelija”, “Pine”, “Tivat”, “Palma” and “Villa Royal” are the names of some hotels that, besides the private accommodations, can entertain up to eight thousand guests. The tourist settlement of “St. Marko”, built for the needs of the Parisian Mediterranean club (aka Club Med), is certainly an attraction. It consists of about a hundred cottages, nicely fitted into the natural surrounding of dense greenery for the enjoyment of the guests. Tivat boasts a beautiful botanic garden thanks to the Bokan sailors who brought back a wide variety of exotic tree species and ornamental plants from their voyages around the globe. It is important to know where the attractive spots are in this municipality. From Lepetane, which is part of Tivat, a car ferry connects with the western Herceg Novi side of the Boka Kotorska. Tivat as the youngest settlement of all cities in the Boka Kotorska, has made it that it has less history than the other cities. That is why accommodation in monumental buildings hardly occurs, as is the case with the other coastal cities. What Tivat has to the other cities is the geographical location. It is the most open city with the most hinterland in the bay. In addition, it also has the better beaches, swimming opportunities, and pleasant climate of all the cities in the bay. And like the other cities, Tivat also focuses it’s economy on tourism development, and then mostly on tourists who spend a lot of money. The former naval port has been renamed Porto Montenegro and accommodates 800 pleasure yachts, 150 of which are reserved for mega yachts. These investments have had many consequences for Tivat, and much of the sea promenade and center has been refurbished. Also in Tivat, more accommodations have been added in recent years, but to a lesser extent than around the tourist attractions of the Bay. Tivat has a modest range of hotels. 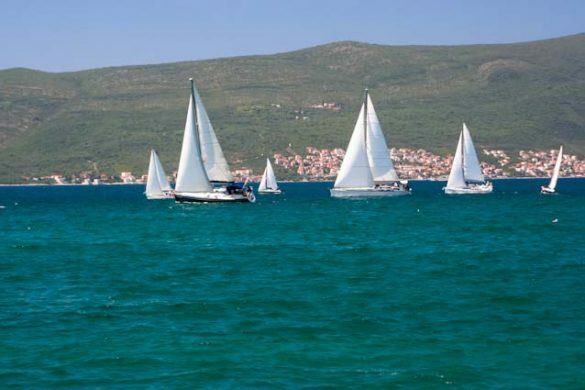 Accommodation in Tivat consists mainly of apartments and private individuals who rent rooms. 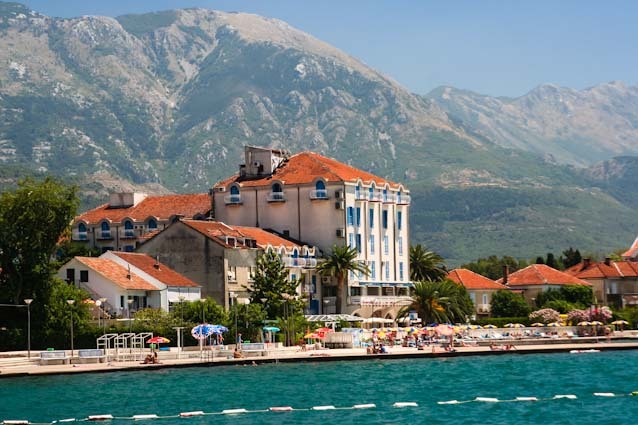 Best Hotels in Tivat € 0 – € 100 per night. Palma Hotel – Hotel Palma, categorized as a 4-star hotel, is just 5 meters from the coast, in the heart of Tivat. The hotel has 113 modern furnished and comfortable rooms, most with sea views. The hotel also offers a wide range of treatments in the spa center. Facilities : Restaurant (à la carte and buffet), Snack bar, Private beach area, Terrace, Spa and wellness center, Sauna, Hot tub / jacuzzi, Airport shuttle, Massage (surcharge), 24-hour front desk, Meeting / banquet facilities (Surcharge), Free Wi-Fi , Bar. Hotel Pine – Hotel Pine is located in the center of Tivat, just 160 meters from the beach. All rooms are air-conditioned and feature a flat-screen TV with cable channels, a minibar and a bathroom. The hotel’s wellness center includes a sauna and a fitness room. The hotel has its own bar and restaurant. Facilities : Restaurant (à la carte), Free Wi-Fi, Laundry (surcharge), Terrace, Dry Cleaning (Surcharge), Ironing Service (surcharge), Sauna, 24-Hour Front Desk, Fitness Center, Luggage Storage, Airport Shuttle, Car Hire, Free Parking. Hotel Helada – Located just outside the center of Tivat, 200 meters from the sea, Hotel Helada offers a restaurant with a terrace and air-conditioned accommodation. The hotel has a sun terrace and views of the mountains, and guests can enjoy a drink at the bar. Each room is equipped with a flat-screen TV with cable channels, a safety deposit box and a seating area. Most rooms have a terrace or a balcony. The private bathroom includes a shower, free toiletries and a hairdryer. Facilities : Restaurant (à la carte and buffet), Free parking, Free Wi-Fi, Terrace, Snack bar, Bar, Airport shuttle, Laundry (surcharge), Ironing service (surcharge), Luggage storage, Room service, 24-hour front desk, Terrace, Safety deposit box, Patio, Secure parking. La Roche Hotel – Boutique Hotel La Roche is located in the center of Tivat. It offers a seasonal outdoor pool and a private beach area. The hotel has a barbecue, sun terrace, and on-site restaurant, where guests can enjoy a meal. Each room at this hotel is air conditioned and has a flat-screen TV. Some have a seating area where you can relax. Some units offer sea or mountain views. Facilities : Restaurant, Free parking, Free Wi-Fi Internet Access Included, Terrace, Snack Bar, Bar, Airport Shuttle, Laundry, Ironing Service, Luggage Storage, Car Hire, Room Service, Bicycle Rental, Breakfast in the Room, 24-Hour Reception, Private Check-in / -out, Safety Deposit Box, Outdoor Swimming Pool (subject to charges) Seasonal), Car Hire, Concierge Service, Spa & Wellness Center, Private Beach Area, Ticket Service. Riva Guesthouse – Guest House Riva is located in the heart of Tivat on the main promenade that runs along the sea. Some units offer views of the sea or city. Facilities : Free Wi-Fi, Ironing Service (surcharge), Laundry (surcharge). Guest House Ivana – Guest House Ivana enjoys a quiet location surrounded by greenery, 1500 meters from the beach and 2 kilometer from the center of Tivat. It offers accommodation with free Wi-Fi and a balcony overlooking the sea. All accommodations are air-conditioned. Guest House Ivana has a garden with barbecue facilities. Location – Tivat, 2 km from the center. Facilities : Airport Shuttle, Free Wi-Fi, Bicycle Rental (surcharge), Car Hire (surcharge), Terrace, Garden, BBQ Facilities, Free Parking, Ironing Service (surcharge), Laundry (surcharge), Dry Cleaning (surcharge). Apartmani Ratkovic – Apartments Ratković features a barbecue and views of the mountains. Free parking is available on site. The accommodation is air conditioned and has a TV. There is a seating and / or dining area in some units. A fridge and kettle are also offered. Some units also have a kitchen, fitted with an oven, a microwave, and a stove-top. Apartments Ratković features free Wi-Fi throughout. Towels are provided. Apartments Ratković also includes a terrace. Location – Tivat, 150 meters from the center. Facilities : Free Wi-Fi, Free Parking, Airport Shuttle, Car Hire, Bicycle Rental, Terrace, Garden, Grocery deliveries (surcharge), Breakfast in the Room, Ironing Service (surcharge), Laundry (surcharge), Dry Cleaning (surcharge). Hostel Anton – Hostel Anton is located 500 meters from the center of Tivat. All accommodation includes a fan, free bed linen and towels. Guests can use the shared bathrooms, the storage room with free lockers and the small library. Anton Hostel offers breakfast, which is included in the rate. During the summer, the hostel is also a restaurant and in the low season guests can use the communal kitchen. A laundry and ironing service is available at an extra cost. Location – Tivat, 500 meters from the center. Facilities : Free parking, Free Wi-Fi, Laundry (surcharge), Airport Shuttle, Bicycle Rental, Shared Kitchen, Shared Lounge / TV area, Luggage Storage, Ironing Service (Surcharge), Terrace, Garden, Restaurant, Bar, Safety Deposit Box. Tivat airport, 4km off town, connections with Belgrade, Moscow, Frankfurt, Paris, Prague. The following airlines operate to/from Tivat Airport: Air Moldova (Chiṣinǎu, seasonal), Jat Airways (Belgrade), KrasAir (Moscow-Domodedovo), Montenegro Airlines (Belgrade, Copenhagen, London-Gatwick, Moscow-Domodedovo, Paris-Charles de Gaulle, Pristina, Rome-Fiumicino, Skopje, St Petersburg), Moskovia Airlines (Moscow-Domodedovo) Rossiya (St Petersburg), S7 Airlines (Moscow-Domodedovo), Transaero Airlines (Moscow-Domodedovo) There are also Charter flights to Moscow, Helsinki and other cities. Podgorica airport is 90km away, and has flights throughout the year to Belgrade, Istanbul, Budapest, Zurich, Frankfurt, Ljubljana, Paris, Rome, Vienna and , London-Gatwick. Buses run from Podgorica to Kotor year round. Montenegrin airports. A taxi to Kotor will cost €80, when you arrange the transfer at least a day before. Taxi drivers at the airport use a approximately price of 100 euros. There is a large border crossing and a small border crossing, the small crossing is a 7 km detour but less busy and may prevent waiting up to two hours. Taxi drivers might ask for more money (e.g. 10 euros extra) to go via the small border, even though it is in their interest to do so. By the Adratic Motorway, connecting Dubrovnik and Podgorica. Car ferry connection with Lepetane. Botanic garden — Tivat boasts a beautiful botanic garden thanks to the Bokan sailors who brought back a wide variety of exotic tree species and ornamental plants from their voyages around the globe. Porto Montenegro — In summer 2014 Tivat became home of a luxury yacht marina called Porto Montenegro. Gornja Lastva — Small, lovely medieval village just up the hill from Tivat in the Vrmac range. Wifi is available in the marina port of Porto Montenegro. Most restaurants and terraces in old town have free wifi, you will get the password on request if you order something. Perast — a well preserved village, built entirely in barroque style, a UNESCO World Natural and Historical Heritage Site. From Perast there is a boat ride to the man-made islet of Gospa od Škrpjela (Our Lady of the Rocks). Upon returning home safely, seamen dropped rocks and old boats filled with rocks in this place and gradually created the islet as the foundation for the church. The island of Gospa od Skrpjela — The Island Gospa od Skrpjela is one of two gorgeous islands in Kotor Bay, which are situated in the bay across from Perast (in the Kotor municipality). The other island, which also should be visited, is the island Sveti Djordje (St. George). That island is also called “the island of the dead captains”, because according to a legend one French soldier, by shooting from cannon towards Perast, hit a house of his beloved girl and killed her. That legend was a motive for the master piece “The Island of the Dead” by the Switzerland painter Beklin. The island Gospa od Skrpjela is an artificial island, made by seaman from Perast and Kotor, who on their big sail boats brought in large boulders. According to stories, fisherman from Perast, after a shipwreck near the island, found an icon of the Holy Mother of God with the Christ on a sea rock, so they vowed to build a church on the island. They built the church in 1630. As the island had to be maintained, seaman continued to bring in stones, so that tradition is alive even today. It is called Fasinada from Perast (July 22).